The human race thrives on civilization, and civilization thrives on urbanization. Eons ago, the first cities were just small settlements of nomadic people – with no structure, no permanence, and certainly no concept of landscape or architecture. As the centuries passed, cities were formed – from Acropolises and forums, to the modern city of today where massive urban development has taken shape in the form of tall skyscrapers, suburbs and metropolitan areas. Infrastructure runs through our cities like concrete veins – grey and thriving, leaving very little room for the green. Where once, most of the world was green, today, an average underdeveloped city has two percent of plant life, and ninety-eight percent concrete mega structures. It is a major issue, exacerbating problems such as urban pollution and global warming to the forefront. The construction industry – both architecture and landscaping – continually develops, keeping the issue of greenhouse gas emissions in mind, whilst taking bounding steps to increase the green in cities. Where horizontal ground is being covered by the construction front, the vertical ground is evolving – taking on the role of thriving with plant life. Known as living walls or vertical gardens, the technical term for this sort of landscape architecture would be hydroponics, and it is an industry growing in leaps and bounds, tackling the issue of carbon dense air and the urban heat islands generated by excessive heat retaining concrete. 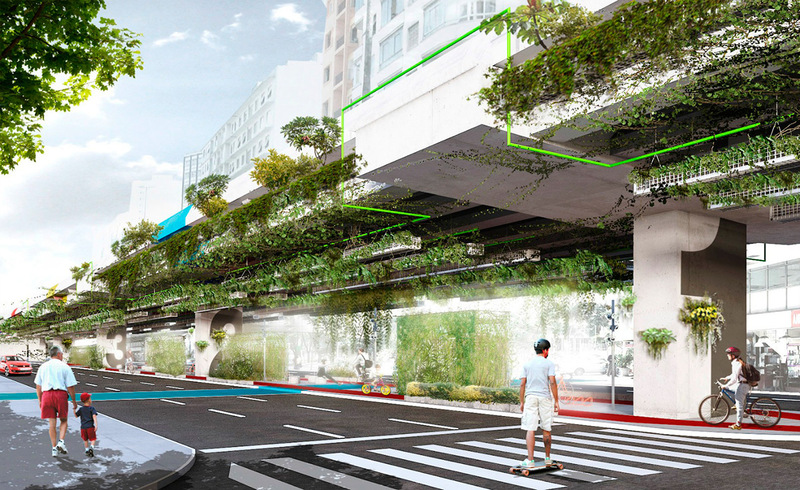 Mexico City is now turning its highway pillars into vertical gardens. As the infrastructure that runs through the city in a ubiquitous fashion, the massive use of concrete had led to a concaving of the urban space – too much smog, and no plant life; a depressingly obsolete urban landscape. This venture is known as the Via Verde Project; a citizen led initiative that aims to fight pollution, bring the city literally back to life and ultimately decrease motorists’ stress levels. The project not only aims to alleviate the urban aesthetic of the city via vertical gardening, but also strives for the betterment of aura, and its impact on the users of the space to elevate productivity and minimize the anxiety that comes with such surroundings. These green walls consist of several species of plants, which generate oxygen, absorb pollutants and help moderate the hum of constant traffic noise. The plants are designed to survive off an automated irrigation system that would be supplemented by rainwater. They’d be grown not in soil, but in a cloth of specific density that allows the root of a plant to interweave into the cloth. It is an admirable initiative by the locals, and government alike. This project aims to make a dark, depressing highway underbelly into a thriving, urban space. Based on the concept of vertical gardens, Triptyque Architecture, a Franco-Brazilian Firm, aims to convert the dank underbelly of the Minhocao viaduct under section into a hanging garden. A totally unique concept, it takes its inspiration from hydroponics and throws a curveball at the very idea of vertical gardening. The suspended landscape would consist of oxygen rich plants, which would filter twenty percent of carbon dioxide emissions, whilst the horizontal underside would be designed on alternating hard and soft landscape. In addition to that, the building is dressed in glass and heliostat motorized mirrors, which redirect the sunlight to surrounding gardens. An otherwise splendid concept that almost appears surreal yet captivating. 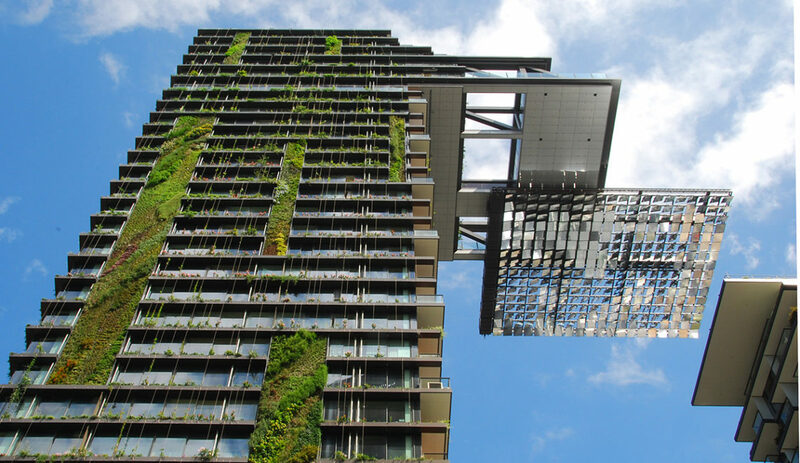 Vertical gardens come in all shapes and sizes, and serve not only the purpose of oxygenating the environment but create a city fabric that is aesthetically pleasing. The Mexico Highway vertical gardens achieve both an aesthetic curiosity as well as a functional paradigm that helps achieve a better environment for the city. 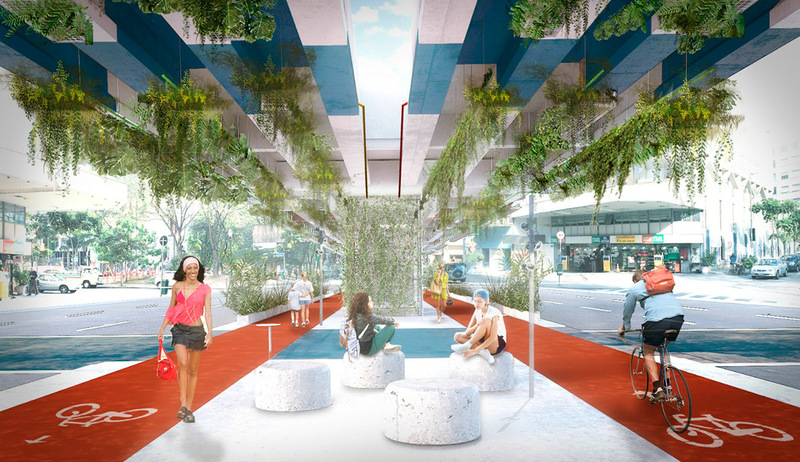 The Hanging Highway Gardens of Sao Paolo are a testament to creativity in an otherwise rigid phenomenon. The designers have taken the concept of a vertical garden, and literally turned it upside down to create an urban fabric that is visually challenging and thought provoking. One Central Park on the other hand, takes the conventional vertical garden and uses it to amalgamate the buildings with its surroundings – a metaphorical green endeavor. All of these fascinating projects give rise to great examples of how urban landscape design is changing our cities not only in a visually pleasing and aesthetic way, but how we interact with them and how they affect our lives and wellbeing as residents within these metropolitan spaces. Surely a model for the future across the globe no doubt. Julian has a wealth of practical and hands-on industry experience, having managed the provision of professional landscape architecture, ecology and arboriculture services to private and public sector clients in the United Kingdom for over three decades. His track record makes for essential and highly credible reading about the fast changing nature of our industry. Cite this article: "Vertical Gardens: A New Era in Landscape Design," in ArchEyes, September 15, 2016, http://archeyes.com/vertical-gardens-landscape-design/.